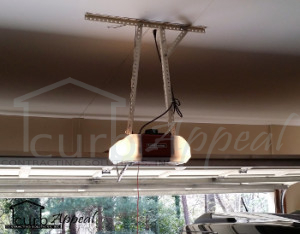 This new LiftMaster garage door opener was installed in Gainesville, GA. Belt drive openers like this one are known to operate much more quietly that chain driven openers. This makes them a good option for someone with living space, especially bedrooms, above or adjacent to the garage. This new belt drive opener is sure to impress with how quietly it runs. For more information on our garage door openers and installation, contact us online, or at 678-714-7393. Our service area covers Gainesville, GA and the metro Atlanta, GA area.